Pinnacle Studio -ohjelmistoperheestä tullut uusi versio. HD-mahdollisuuksia, uuden yksinkertaistetun käyttöliittymän, joka helpottaa sisällönhallintaa, sekä yhtenäisen kuvantallennus/siirto -hyötyohjelman uusimmille formaateille ja videokameroille. Muita uusia ominaisuuksia ovat mm. Nämä tarjoavat täydet mahdollisuudet työskennellä HDV- ja AVCHD-formaattien kanssa. Lisäksi voidaan siirtää elokuvia Flashiin, QuickTimeen, PS3:een, Nintendo Wiihin, Xboxiin, Apple iPodiin sekä moneen muuhun sovellukseen ja laitteeseen. Pinnacle Studio Ultimaten ja Pinnacle Ultimate Collectionin avulla onnistuu myös Blu-ray -levyjen koostaminen motion menuineen. Päivitykset Studio 9, 10, 11 ja 12 versioista. (sekä 32- että 64-bittisen), Windows XP SP3:n ja Windows 7:n kanssa. Capture, edit and tell your story. 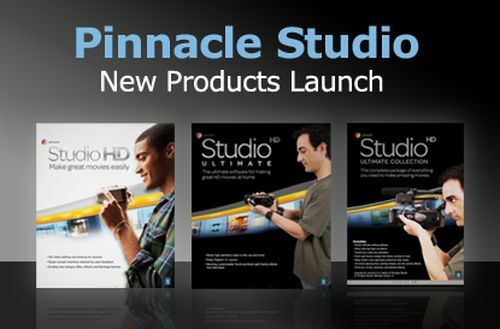 Pinnacle Studio™ HD is plenty powerful, yet a cinch to use. Easily add emotion with music, heighten suspense, hilarity or surprise by editing scenes and create impact with Montage Themes, transitions, animations and effects. Our user-friendly drag-and-drop interface makes it easy for you to grab photos and videos from your video or still digital camera, phone or computer to create your own high-quality HD movies. Once finished, share your masterpieces with friends, family… or the world with Studio HD direct upload to sharing sites like YouTube. Share straight to DVD, YouTube (with wide-screen export)*, the web and more. Add Hollywood-style animations and transitions with over 80 Montage themes. The ultimate software for making great HD movies at home. Harness the power of a professional editor with easy at-your-fingertips execution. Tell your story with clear high-definition video, stunning effects, polished transitions and animation, all backed with incredible Dolby Digital® 5.1 sound and technology from Avid® (behind the world’s most-watched movies). Then, get ready to go viral when you share your screen sensations with the world in widescreen format, the way they’re meant to be seen. Sharing options are now as limitless as your creativity: from Blu-ray and AVCHD to YouTube, iPod, Nintendo Wii, and everything in between. The complete package of everything you need to make amazing movies. Boost your story with our top-tier release from the Pinnacle Studio™ Family, Pinnacle Studio Ultimate Collection. The collection includes a complete set of plug-ins and a Chroma-key green screen for advanced effects, editing and production, in addition to feature-rich Studio Ultimate software. With a new, simpler interface, create top-quality movies in high-definition video, include stunning effects, transitions, animation, and incredible Dolby Digital® 5.1 sound, empowered by new tools from Avid’s professional lines of film-editing products. Then, dazzle your audience when you share your sensations in widescreen format. Sharing options are as limitless as your creativity: from Blu-ray and AVCHD to YouTube, iPod, Nintendo Wii, and more. The new super-simple interface makes Studio even easier to use than before! A new capture and import utility that lets you grab photos and videos easily from nearly any device. Create high-quality animations and fast-motion effects with the new stop motion capture option. Lots of new templates and designs are included (13 new DVD menus, 58 new Montage templates and up to 68 new titles). An enhanced Studio Montage interface offers greater control. Studio standards such as SmartMovie, automatic background music creation, Pan & Zoom effect and so many more!